Pope Francis is beloved by most Catholics, so there are a lot of people around our area looking forward to this weekend. They are, if you will (even if you won't -- it's my blog, after all), quite "popeful," in every way, about his soon-to-be presence in Philadelphia. That said, I have heard a ton of moaning over road closures, security perimeters and general disruptions. From the general buzz, you would think people are being asked to give up their left arms. We do like to be in our little zones, don't we? We like our routines to remain undisrupted. Maybe it is a forest-for-the-trees thing. Probably the most important pope of all time (too early to say, I know, but I have a feeling; oh, and not-counting Peter) is coming to our area and people are bugged that they have to stay home or deal with traffic inconvenience. Whatever the case, it is one weekend. I don't know. It just seems to underscore today's rampant egocentrism. 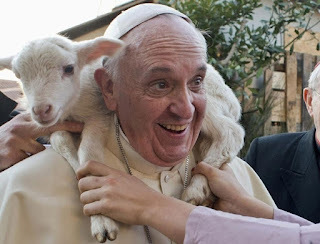 Shouldn't everyone -- Catholics and non-Catholics, alike -- be happy that the leader of the biggest Christian church in the world is coming to their town to spread a message of love, inclusion, tolerance and environmental concern and economic equality? Nah. Ain't worth it. As one Catholic put it in a radio interview, yeah, he's glad the Pope is coming, but all this security stuff just kills it. Just isn't worth the frustration. I mean, it is not like we didn't have notice enough to make alternate plans or to fly to Tahiti; or, to just do what we poor Catholic school teachers do: stay home and watch Francis on TV. I, for one, am glad the Big Guy is stopping by. He's what our world needed and Philly could use a dose of Pope-hope.